Large Lobsters Boiled and Cracked from Young Bruce - see note. Note: It is ok to boil small lobsters. We prefer large lobsters, boiled, and pre-cracked. Boiling is the fastest way to prepare a lobster and it never tastes better. Leave all that stuffing and baking to restaurants. If you want to stuff a lobster, make sure that it is a large one, at least 3 lbs. and see Michael O'Brien's Baked Stuffed Lobster on Skewers . 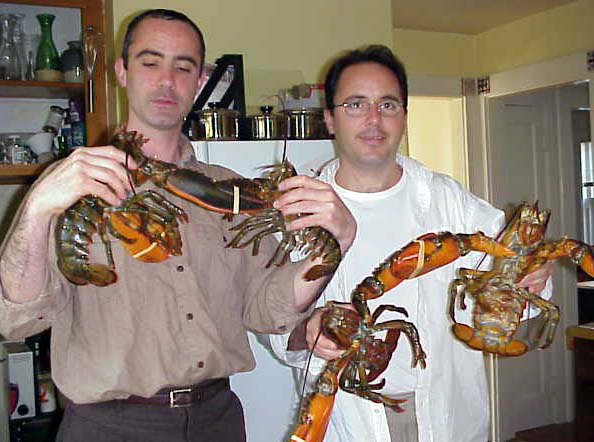 Above: Sean and Young Bruce prepare lobsters in Belmont 1999. In top of double boiler; melt butter, add flour and mustard to make smooth paste. Slowly add liquid from the can of lobstermeat, cream and milk. Stir and cook until smooth and thickened. Remove from heat. Add cut-up lobstermeat and bread cubes, place mixture in casserole. Top with course butter bread crumbs, salt to taste and lightly garnish with paprika. Bake at 350 degrees until crumbs are lightly browned. Makes about 4 generous servings. just melted. Add the chives. over the lobster and serve immediately with the remaining butter. Recipe from Weber's Charcoal Grilling by Jamie Purviance. Jasper White's extensive research into the history and culture of New England's cooking style and his bold renditions of New England chowder, shellfish, and lobster dishes have made him the leading spokesman for New England's regional cuisine. His cooking has also won a lot of awards. He was appointed to Food & Wine's Honor Roll in 1983, and Cook's Who's Who in 1984. He received the Ivy Award in 1990 and the James Beard award for Best Chef in the Northeast in 1991. You'll find Jasper White's philosophy along with the recipes for his magical chowders in his cookbook, Cooking from New England, published by HarperCollins. Bring a large pot of salted water to a rolling boil. Drop the lobsters in for exactly 3 1/2 minutes. Allow the lobsters to cool at room temperature. When cool enough to handle, shuck the meat from the claws, knuckles, and tails. Cut into 3/4-inch pieces and reserve. Peel the tomatoes by scoring the top of each one and blanching in boiling salted water for 30 seconds to a minute. As soon as you see the skin loosen, remove and shock in ice water. Peel off the skin; quarter tomatoes and cut away the seedy center. Dice the remaining tomatoes into 1-inch chunks. Reserve. Cook the spaghetti in a large pot of boiling salted water until al dente. Meanwhile, heat up a large (10-inch) saut� pan and add the olive oil. Place the lobster meat in the hot oil, along with the garlic. Grind a little pepper over the lobster. Saut� for 1 minute -- you will see the oil turn red. Now add the tomatoes, capers, and basil. Cook for 2 more minutes. Drain the pasta and add to the pan along with the sweet butter. Salt and pepper to taste. Divide evenly into 4 warm bowls and serve at once. Yields 4 appetizers or light lunch portions. Robb Walsh is a contributing editor for American Way and the recipient of the 1996 James Beard Foundation Journalism Award. 4 fresh basil leaves, torn into pieces. cool, peel. Cover, and refrigerate until needed. minutes. Add tomatoes and thyme. Cover, and cook for 30 minutes, stirring at times. vinegar, salt and pepper in a small bowl. Slowly whisk in oil. and toss to coat the leaves. York, (212) 826-6514; 4 ounces, $8.50. If using lobster tails, cut them in half lengthwise with kitchen scissors or a sharp, heavy knife; use a fork to remove the intestinal vein running the length of the tail. If using live lobsters, kill each by inserting a sharp knife in the back of the head between the eyes; this will dispatch them instantly. (Alternatively, bring 8 quarts of water to a boil in a large pot with a lid. Cut the lobsters in half lengthwise and remove the vein and the papery gray sac from the head. Break off the claws and crack with a nutcracker. Set the lobsters or tails aside while you prepare the ginger-mint butter. ginger, garlic, and lime zest and increase the heat to medium. Cook until the mixture is fragrant, but not brown, about 3 minutes. Stir in the fish sauce and lime juice and bring to a boil; then remove from the heat. Brush the cut sides of the lobster tails or lobsters with the ginger-mint butter and sprinkle with salt and pepper. When ready to cook, oil the grill grate. 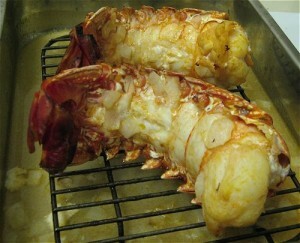 Arrange the lobster halves or tails and claws (if any) cut sides down on the hot grate and grill for 6 to 8 minutes. Turn, using tongs, and grill on the shell sides until the flesh is firm and white, 6 to 8 minutes more, brushing generously several times with the butter as the lobsters cook. Transfer the lobsters to serving plates or a platter and pour any remaining butter over them. Serve immediately. Combine the lobster, shallots, garlic, ginger, jalapenos, carrots, celery, and vanilla bean in a large sauce pan and saute foe 3 to 4 minutes. Add the wine and cook until the mixture is reduced by half. Add the chicken stock and reduce by a third. Add the coconut milk and heavy cream and cook for 10 to 15 minutes until it is thickened. Then thoroughly break up the lobster shell - to release the lobster taste into the sauce - with the back of a heavy spoon or an immersible blender. Strain cooked sauce well through a colander lined with cheesecloth or a fine chinois. Return sauce to saucepan and season with salt and pepper. Whisk in the butter to emulsify and reduce sauce again over high heat. Cook pasta slightly less than al dente and add to the saucepan. Serve with sauteed shrimp or grilled salmon. Open can of lobster meat and cut into bite size pieces, draining and saving juices and shell bits. Combine the shallots, garlic, ginger, jalapenos, carrots, and celery in a large sauce pan and saute for 3 to 4 minutes with the oil. Add the wine and vanilla and cook a few minutes. Add the chicken stock and cook a few minutes. Add the reserved lobster juice. Strain sauce well through a colander lined with cheesecloth or a fine chinois. Discard vegetables. Return sauce to saucepan and add the coconut milk. Cook a few minutes and add the lobster pieces. Mix the cornstarch and water and stir into sauce to thicken. Remove from heat and whisk in the butter to finish sauce. Cook pasta slightly less than al dente in plenty of boiling salted water. Drain pasta and put on serving plates. Pour lobster mixture on pasta and top with cracked black pepper. Enjoy! Serving Ideas : Wonderful as a buffet dish. Detach tail from live lobster. Remove roe and set aside. Cook in lobster tail in court bouillon (white wine, onions, carrots, celery, peppercorns, lemon and water). Cook rice according to directions using strained court bouillon as part of the liquid. When rice is done, add some of the roe butter. Risotto will turn pink. Add lobster pieces. Marie graduated from the Culinary Institute of America. She teaches Culinary Arts in New York. Her husband, Patrick Hayes, also a graduate of the CIA, is Maddie's brother..
Real French Bouillabaisse with Mediterranean seafood is not a practical dish to make in America, so the Vanderbilt chef, Joseph Donon, created Bouillabaisse Newportaise which consists of all Rhode Island seafood. Chef Donon (1888-1982) came to America in 1912 as chef de cuisine for Henry Clay Frick. He returned to France to serve in World War I; he was awarded the Croix de Guerre and the Médaille d'Honneur. Back in the United States, he supervised the kitchens of Mrs. Hamilton McK. Twombly, daughter of William H. Vanderbilt in Manhattan and in Newport.Chef Donon is the author of The Classic French Cuisine : A complete cook book for Americans - the distillation of a master French chef's lifetime experience, from which this recipe is taken. Add the remaining ingredients, toss well to blend, and set refrigerator for 2 hours. Half an hour before serving time, put fish, seasonings and wine in a large flat pan and bring the liquid quickly to a boil. Reduce the heat, cover the pan, and simmer gently for 15 - 20 minutes. The fish is sufficiently cooked when it is opaque and flakes readily at the touch of a fork. Adjust the seasoning and serve the bouillabaisse in a soup tureen, with toasted French bread. Chef Michael O'Brien, of Carrie's Seafood restaurant in Providence prepares award winning three pound baked stuffed lobster, served with wine. He showed how to make his popular dish on Carrie’s Cooking Show which at one time aired Fridays at 6 p.m. on Cox Channel 3. On the March 20th interview, Chef Michael O'Brien cooked 3-lb lobsters with a stuffing which had clams and a bit of bacon. Split the lobsters, being careful to not break the backs. Insert a long skewer up the back so lobsters will not curl. Drizzle the stuffing with butter so stuffing will toast, not burn. Bake at 450 until done. They are done when flesh in no longer gray, but pure white. Interview Channel 3 Michael O'Brien, March 20, 2009. Carrie's has the best 3Lb. hard shell lobsters! Voted Best Lobsters In Rhode Island! Boiled Or Boiled With Steamers - your choice! Frances Rivera has an exquisite fall recipe that's easy to fix and sure to delight! We�re making butternut squash risotto with lobster -- a perfect way to welcome fall in tonight's Dish. Bring approximately three quarts of water to a boil with a generous pinch of sea salt. At boiling - after removing rubber bands from claws - add lobsters and simmer for 6 minutes. Remove lobster from water and place directly into an ice bath (50/50 water to ice.) This will stop the lobster from overcooking and make it easy to remove the meat. Separate the lobster meat from the shell keeping the tail and, especially the claws, in one piece. Set aside the claws for garnish and cut the tail and knuckles into bite-size pieces. Keep chilled until ready to finish risotto. Cut the butternut squash in half, lengthwise. Coat one half with olive oil, season with salt and pepper, and roast, face down, at 350° for 25 minutes or until soft. Peel the remaining half and dice into 1⁄2 inch pieces and dice the onion to the same size. When roasted squash is cool, remove skin, stir into a smooth puree,and season, if necessary. In a medium-size saucepan, melt half the butter over medium heat and add diced onion. Cook until translucent and add diced squash. Season with salt and pepper. Add the Arborio rice and toast rice with the vegetables for about 2 minutes. Add 21/4 cups of chicken stock slowly, a ladle at a time, stirring constantly, waiting until most of the liquid is absorbed before adding more. This process brings out the starches in the rice and is the key to a creamy texture. When half the chicken stock is added, fold in roasted squash and continue to add stock and stirring until rice is al dente. Take risotto off the heat and stir in 1ounce butter, thyme, and cut lobster, season well. In a small saucepan, add cider, 1⁄4 cup of chicken stock and bring to a boil. Add remaining butter and a pinch of salt. Place lobster claws in the cider butter and warm through. Place risotto into two serving bowls and garnish with the lobster claws, cider butter, and fresh chervil. Parboil the lobsters for 3 1/2 minutes; drain and cool at room temperature. Use a cleaver to crack the shell and remove lobster meat. Cut the meat into 3/4-inch dice, cover and refrigerate. Soak the dried porcini in hot water until tender. Drain, reserving the soaking liquid, and coarsley chop. Slice the fresh mushrooms about 13-inch thick. In a large saut pan, melt 3 tablespoons of butter over medium heat. Add the lobster pieces and saut them about 2 minutes until fully cooked. Lift lobster out of the butter, letting it drain over the pan before putting it on a plate. Cover to keep warm. Add the shallots to the butter and cook 1 minute. Add the fresh mushrooms and cook 2 to 3 minutes more until the mushrooms are soft. Add the dried mushrooms, soaking liquid and cream. Bring to a boil, season with salt and pepper and remove from the heat. the mushroom mixture to a boil. Drain pasta so it's as free of water as possible; add it to the saut pan. Add lobster meat, remaining butter and parsley. Mix thoroughly over heat. When noodles are well-coated, serve. Saute a couple smashed garlic cloves with a good splash of olive oil until they become fragrant and turn golden, about 2 minutes. Add a sprinkling of crushed red pepper flakes, some chopped fresh rosemary, and a 28-oz. can of whole peeled tomatoes. Add a handful of the lobster shells, bring to a boil, cover and simmer for 10 to 15 minutes so the sauce picks up some of the lobster flavor. Discard the shells and puree the tomato sauce (you can discard the garlic if you like). Cook pasta and add to the sauce along with the diced lobster. Pick the lobster meat from the shells and cut into large chunks. In a small bowl, mix 1 cup or so of mayonnaise with the zest and juice of 1 lemon, a little Tabasco, some salt and pepper and whatever you’re feeling for fresh herbs (I like tarragon with lobster). Stir-fry some coarsely chopped garlic and ginger with a splash of peanut oil. Add 1 or 2 chopped Thai chiles (or 1 jalapeno), a light sprinkling of crushed red pepper flakes and some diced celery and red pepper. Stir-fry until the vegetables are tender, then add a splash of soy sauce, a drizzle of balsamic vinegar (which replicates the Szechuan black vinegar), some toasted sesame oil and a cup or so of chicken broth. Bring to a boil and then thicken with a little corn starch if you like (1 tsp. corn starch with 1 Tbs. water). Stir in the lobster (chopped into large pieces – use a chef’s knife or cleaver) and cook until just heated through. Serve sprinkled with thinly sliced scallions and Jasmine rice.